Remove artifacts& blotchy look making images looking as saved with 100 quality, Uses a unique technology that lets even the novices to easily, quickly and effectively remove the so-called "JPEG artifacts" and a "blotchy look" from his/her images! Jpeg Fixer is an powerful and easy to use and extremely powerful program that lets you recover the images, damaged by a low-quality JPEG compression and uses the unique technology that lets even the novices to easily, quickly and effectively remove the so-called "JPEG artifacts" and a "blotchy look" from your JPEG images. 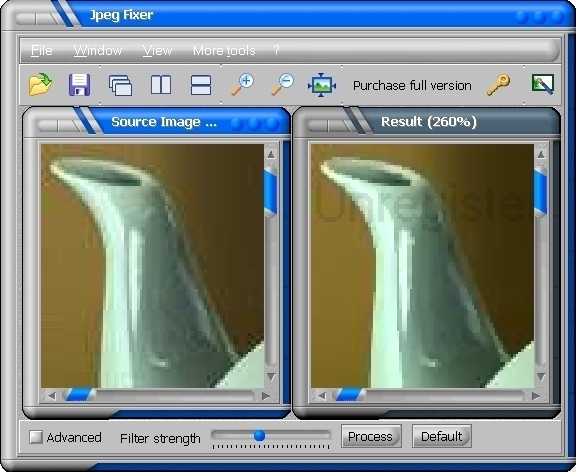 Uses a unique technology that lets even the novices to easily, quickly and effectively remove the so-called "JPEG artifacts" and a "blotchy look" from his/her images. Unlike all other methods, our intellectual science-intensive technology, developed by graduated scientists, doesn't damage your photos simply by blurring them, but recovers them, meaning that your images will look like they looked before the JPEG compression. Jpeg Fixer is useful for everyone who deals with JPEG images. It's a must have tool for design studios and publishers as well. Recover images spoiled by JPEG compression . Perform median noise reduction . VicMan's Photo Editor - Award-winning image editor with cool interface.